For many years, Mold Junction was the location of the main freight marshalling yard for the North Wales Coast line. 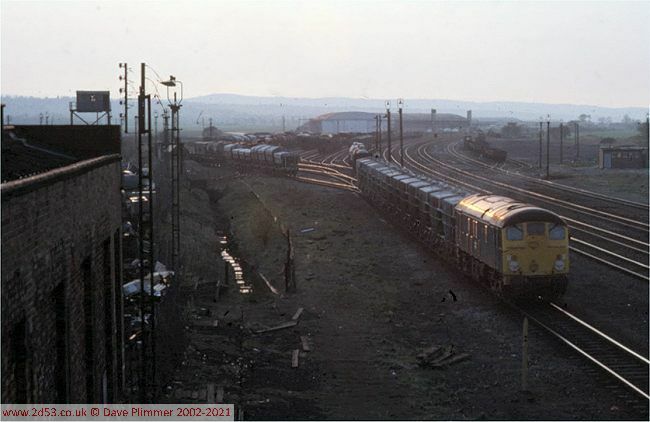 At the time of these photgraphs it was very close to the end of its life, but was still a staging point for freights to Llandudno Junction and beyond, as well as for some workings to Wrexham Croes Newydd. 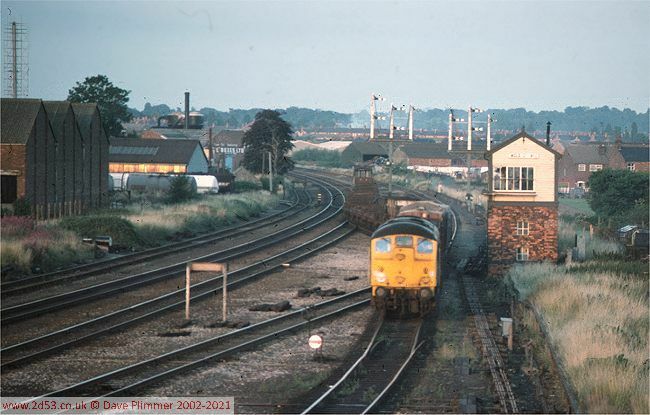 After the photographs are details of the timetabled mandatory, conditional and trip freight workings from the yard in the summer of 1976, with no less than 22 departing trains in every 24 hour period. 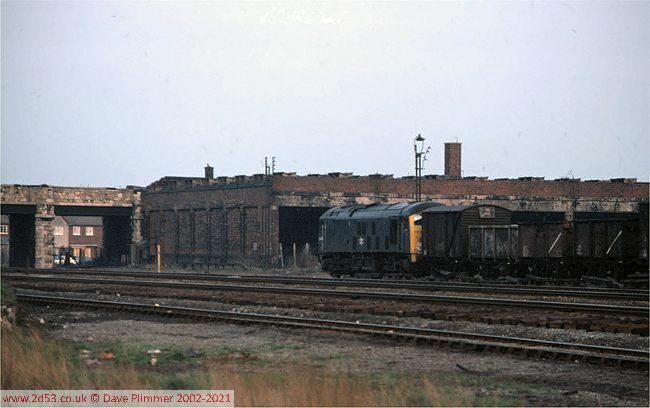 The yard closed in 1980 or 81, but survived for a while longer as engineers sidings. 24063 arrives at Mold Jcn with 8D85 19:10 from Croes Newydd Yard to Mold Jcn, due to arrive 20:14, but running about 30 minutes late, on 29th July 1977. It is crossing from the down fast to the down slow and then into the yard. Note the splendid ex-LNWR bracket signals (although with upper quadrant arms), controlled from Mold Junction No 1 signal box seen on the right. Mold Junction No 4 was also still operational at this time, controlling access to the western end of the yard. This train had reversed at Chester No 5, in the loop alongside the Birkenhead line. Visible to the left of the main line are tank wagons in the wagon works, accessed from the up side headshunt. On the evening of the 28th April 1978, 24035 is seen shunting a rake of Presflo wagons at Mold Jcn. 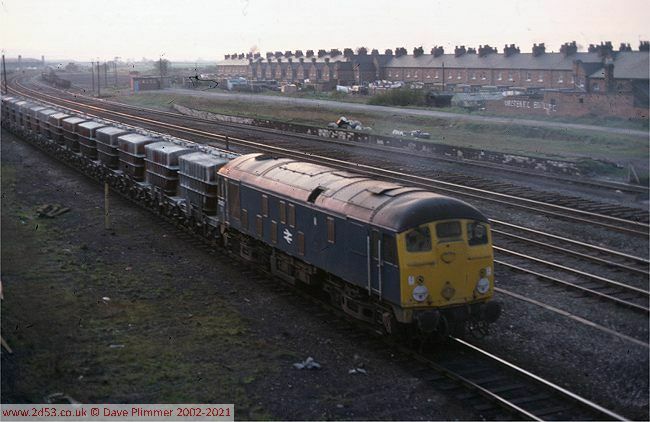 These are probably empties from Bangor returning to Penyffordd, and will run via Croes Newydd Yard at Wrexham. Behind the train are the four main running lines, and on the other side, the remains of the up side yard, once used for handling slate from all the major North Wales quarries served by the LNWR. Finally, terraces of typical LNWR railway houses complete the scene. On that evening, 24023 and 24035, a Class 47 and the resident Class 08 shunter were in the yard. As can be seen from the timetable below (2 years earlier, but still indicative), this would have been a busy time, as the eastbound evening departures were assembled. The line to Mold and Denbigh once curved off to the left of the yard sidings,and a triangle was formed by a curve from Mold Jcn No 4 box. The triangle remained in existance until the yard closed. On the left is the shed wall, and signs of the scrapyard that occupied the shed yard. 24023 moves out of the yard towards No 1 box, ready to leave on one of the eastbound services. As it's only the end of April, the light has almost gone, but behind the loco can be seen the still-extant Mold Junction engine shed, once the provider of motive power for freight workings in the Chester area. There was also once a station here, Saltney Ferry - an island platform accessed by steps from the road bridge, and only served by trains to Mold. SX. (Loco LD from Chester HS). MO. (Loco LD from Chester HS). (Starts at Holywell Jn MSX). MWFO. (Loco LD from Chester HS). 0T29 Connahs Quay CEGB 10:25 10:35 Chester D.D. SX. Freightliner. Attaches vehicles from 4D58. Additionally, Trip 11 (Mold Junction shunt) worked continuously from 00:20 Monday to 05:45 Saturday, except for a break between 12:55 and 15:25 daily.